Editor’s Note: Wakey uppy folks…another false flag “shooting” that just doesn’t bear up to any kind of scrutiny. However, I’d rather focus on love, so stay tuned tomorrow (perhaps Thursday) for an immense wave of love that will turn things around on our planet. It was un-real, and you may have seen this coming. When they won’t let anyone see or be in possession of the actual footage from the mosque shootings under penalty of jail, they REALLY can’t afford to have anyone looking at it closely. That means, like the Sandy Hoax shooting, it wouldn’t stand up to scrutiny. It’s shameless fakery à la Hollywood and the fake news is going to put their spin on it to weave a tale so intricate, many will be fooled. It’s absurd to any thinking Human Being when you look at the evidence taand let’s face it—most of us are experts at analyzing these terror events now—whether real or hoax. We know they are desperate to staunch the flow of truth from the citizen journalists and social media because some very unpopular facts will be forthcoming that the psychopathic NWO cannot withstand. The Storm is just getting going. BTW, did you hear that the marvelous actor playing the role of Gene Rosen in Newtown, CT was a FEMA employee? Imagine. And with the police involved in a drill—again? Same old moth-eaten playbook. A theatrical showdown for effect. More fake bodies? We’ve seen them use dummies before—like the Bataclan massacre in Paris, I believe. Sounds like the perfect mind-controlled patsy. They’re always “known to authorities”, don’t ya know. This entry was posted in Uncategorized and tagged black op, Christchurch, disappearing casings, evidence, false flag, Gladio-style, hoax, love, mass, massacre, mind control, mosques, murder, New Zealand, Patsy, pile of bodies, police drill, police state, setup, shooting, Starship Earth, The Illuminati Plan and tagged agenda. Bookmark the permalink. 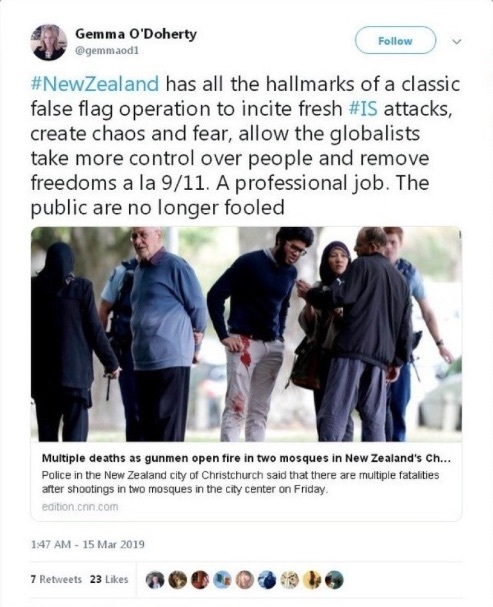 John Pelosi AND Hillary Clinton just happened to be in NZ a few days before this FALSE FLAG. This is yet another attempt by the sad sack Cabal to interfere with GESARA and the release of humanity from their satanic clutches.